On 16 March 2017, an airstrike by the United States Armed Forces killed up to 49 people in the rebel-held village of al-Jinah near Aleppo, Syria. The US military claimed the people targeted in the strike were militants[note 1] belonging to the terrorist group al-Qaeda. However, the Syrian Observatory for Human Rights (SOHR), local residents and local officials have claimed that the building struck was a mosque filled with worshipers. At the time, US military claimed that the structure bombed was not a mosque itself but was next to a mosque, which was undamaged. However, on May 5, 2017, a US Central Command investigation determined that the building was indeed part of a mosque-complex. Rami Abdel Rahman, head of SOHR, claimed the structure was a mosque which held over 300 people at the time of the strike. Forty-two people were initially reported by the SOHR to have been killed, though the group said that by March 17 the death toll had increased to 49, while The Guardian reported that 46 people had died. The SOHR said that most of the casualties were civilians, and more than 100 people were injured. The Syrian Civil Defence said that "dozens" of people had been buried in rubble following the strike. According to a spokesman for the Pentagon, "dozens" of al-Qaeda fighters, including "senior al Qaeda terrorists, some of these were likely high value individuals", were among those killed. Another spokesman stated that initial assessments indicated no civilian casualties. A missile fragment was reportedly found at the attack scene which had Latin alphabet letters corresponding with script found on missiles used by US forces, according to British investigative group Bellingcat. The Syrian Institute for Justice released photographs showing fragments of American weapons at the site of the bombing, which British newspaper The Telegraph cited as evidence that the US was responsible for civilian casualties. 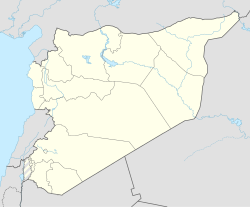 A United States Central Command spokesman, Josh Jacques, confirmed that the United States had carried out an airstrike, but said that the area was "assessed to be a meeting place for al-Qaeda, and we took the strike," and denied both that the mosque had been the target and that it had been the building that was destroyed. "We did not target a mosque, but the building that we did target – which was where the meeting [of militants] took place – is about 50 feet [15 m] from a mosque that is still standing," spokesperson Colonel John Thomas said. Pentagon spokesman Jeff Davis later clarified that the target had been identified as a "partially constructed community center." The photo released by Pentagon showed the mosque was "relatively unscathed," Davis added. The Washington Post reported that two Reaper drones fired at least four Hellfire missiles and dropped a 500-pound (230 kg) bomb in the attack. Within a week of the attack, US Central Command began two internal investigations, one into whether civilians had been killed and another to find additional information about the type of building hit and its occupants. On May 5, 2017, the investigation determined that the building was indeed part of a mosque-complex. In a report released 18 April, Human Right Watch stated that they had "not found evidence to support the allegation that members of al-Qaeda or any other armed group were meeting in the mosque." Local residents in the area reported that there were no members of armed groups at the mosque or in the area at the time of the attack and that the victims were all civilians and local residents. First responders to the initial strike said the dead and injured wore civilian clothes and that they saw no weapons at the site. Human Rights Watch also noted that "U.S. authorities have so far released no information to support their claims." Russia – Defense Minister Sergey Shoygu urged a comment from the United States after photos of a reported US missile fragment found at the site of the bombed Syrian mosque appeared on the Internet. ^ a b c Oakford, Samuel (16 March 2017). "Exclusive: US Says it Carried Out Deadly Strike that Hit an Aleppo Mosque". Airwars. ^ a b c Bethan, McKernan (17 March 2017). "US 'bombed mosque during evening prayers, killing 46 people'". The Independent. Retrieved 17 March 2017. ^ a b c "Pentagon denies striking mosque in Syria, says it killed al Qaeda militants". Reuters. 17 March 2017. ^ a b Staff and agencies (17 March 2017). "US admits Syria airstrike that killed 46 but denies targeting mosque". The Guardian. Retrieved 17 March 2017. ^ Staff writers (17 March 2017). "Air strike on mosque near Aleppo in Syria kills 42: monitor". Reuters. Retrieved 17 March 2017. ^ a b Hennigan, W. J. (17 March 2017). "U.S. military denies airstrike hit mosque in Syria, following reports of dozens killed". Los Angeles Times. Retrieved 26 March 2017. ^ a b "US insists Al Jinah raid targeted al-Qaeda, not mosque". Al Jazeera. 17 March 2017. ^ a b Correspondent, Barbara Starr, CNN Pentagon. "Pentagon investigation: US hit mosque complex". CNN. Retrieved 2017-05-05. ^ a b Staff writers. "Air raid on mosque near Aleppo 'kills dozens'". www.aljazeera.com. Retrieved 17 March 2017. ^ Staff. "Airstrike on mosque near Aleppo in Syria 'kills 42'". The Telegraph. Retrieved 17 March 2017. ^ a b Staff (17 March 2017). "US admits Syria airstrike that killed 46 but denies targeting mosque". The Guardian. Retrieved 17 March 2017. ^ MEE staff. "US denies hitting Syrian mosque in attack that killed dozens". Middle East Eye. Retrieved 18 March 2017. ^ Triebert, Christiaan (16 March 2017). "CONFIRMED: US Responsible for Aleppo Mosque Bombing - bellingcat". bellingcat. Retrieved 18 March 2017. ^ Williams, Sara Elizabeth (18 March 2017). "US denies targeting Syrian mosque where dozens of people died in airstrike". The Telegraph. Retrieved 18 March 2017. ^ a b "Mounting claims of civilian deaths after U.S. targets al-Qaeda in Syria". The Washington Post. 17 March 2017. Retrieved 22 March 2017. ^ "U.S. Military Investigating Reports of Civilian Deaths in Syria Airstrike". The New York Times. 21 March 2017. Retrieved 22 March 2017. ^ "Attack on the Omar Ibn al-Khatab Mosque". Human Rights Watch. 18 April 2017. Retrieved 21 April 2017. ^ "Russia urges US comment on reports of fatal Syria mosque strike". RT International. Retrieved 18 March 2017.